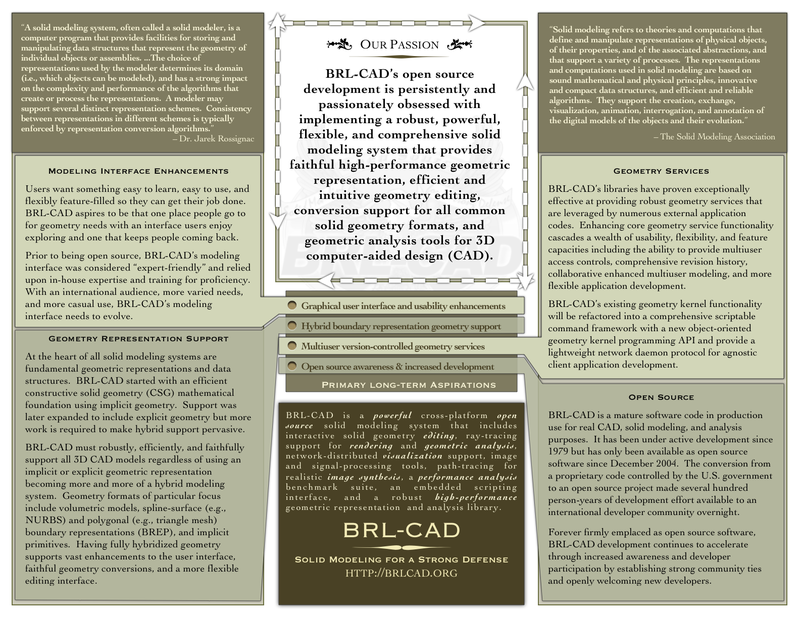 BRL-CAD is a large system with various portions under different license but is predominantly distributed as a collective work under the v2.1 LGPL. Most of our data files and documentation are provided under a modified BSD license or are in the public domain. See our [http://brlcad.svn.sourceforge.net/svnroot/brlcad/brlcad/trunk/COPYING COPYING] file for more details. The "BRL" in BRL-CAD comes from the project's origins at the '''Ballistic Research Laboratory'''. [http://en.wikipedia.org/wiki/Ballistic_Research_Laboratory BRL] was later absorbed into the U.S. Army Research Laboratory in 1992 but BRL-CAD retained its original distinctive name and trademark heritage. BRL-CAD is correctly pronounced as "'''be are el cad'''".